* The Politics of Military Force: Antimilitarism, Ideational Change and Post-War German Security Discourse, under advance contract with The University of Michigan Press (“Configurations: Critical Studies of World Politics” series, ed. Patrick T. Jackson). * “The Contribution of Laclau’s Discourse Theory to International Relations and International Political Economy,” New Political Science, forthcoming 2019, co-edited with Dirk Nabers. 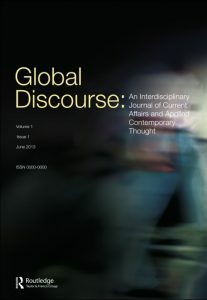 * “The Contribution of Laclau’s Discourse Theory to International Relations and International Political Economy: Introduction to the Symposium,” New Political Science, forthcoming 2019, doi: 10.1080/07393148.2019.1596683, with Dirk Nabers. (pre-print). 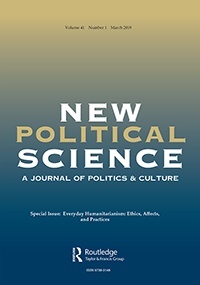 * “Securitization as Discursive (Re)Articulation: Explaining the Relative Effectiveness of Threat Construction,” New Political Science, online first, 2019, doi: 10.1080/07393148.2019.1596682 (pre-print). Armed Forces’ Visual Representation of the Afghanistan Operation on Facebook”, Global Discourse 7:2-3 (2017), pp. 330-347, doi: 10.1080/23269995.2017.1337982, with David Shim (post-print, also available on ResearchGate and Academia). * “Foreign Policy Analysis, Globalisation and Non-State Actors: State-Centric After All?” Journal of International Relations and Development 17:4 (2014), pp. 489-521, doi: 10.1057/jird.2013.12, with Rainer Baumann (download, also available on ResearchGate and Academia). 10.1080/13533311003589264, with Christoph Weller (download, also available on ResearchGate and Academia). “Légitimer l’armée en operation: les interventions extérieures de la ‘nouvelle Bundeswehr’ dans la rhetorique du gouvernement rouge-vert“, Allemange d’aujord’hui (192) 2010, pp. 25-34 (download). 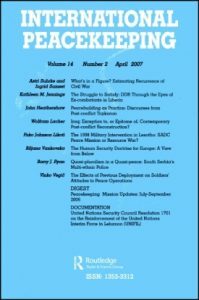 “The Reluctant Peacekeeper: Japan’s Ambivalent Stance on UN Peace Operations”, Japan aktuell – Journal of Current Japanese Affairs 16:1 (2008), pp. 37-55 (download). “Taking Stock: The Focal Points of Abe’s Foreign Policy”, Japan aktuell – Journal of Current Japanese Affairs 15:6 (2007), pp. 53-71 (download). * “Global/International Political Sociology”, in: Renée Marlin-Bennett (ed. ), The Oxford Research Encyclopedia of International Studies, Oxford: Oxford University Press forthcoming, with Dirk Nabers, doi: 10.1093/acrefore/9780190846626.013.371 (pre-print). * “Sedimented Practices and American Identity in Donald J. Trump’s Election Campaign”, in: Frank A. Stengel/David B. MacDonald/Dirk Nabers (eds. ), Populism and World Politics: Exploring Inter- and Transnational Dimensions, Basingstoke: Palgrave Macmillan 2019, with Dirk Nabers. doi: 10.1007/978-3-030-04621-7_5 (pre-print). 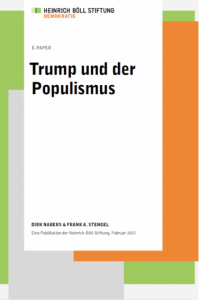 * “Conclusion: Populism, Foreign Policy and World Politics”, in: Frank A. Stengel/David B. MacDonald/Dirk Nabers (eds. 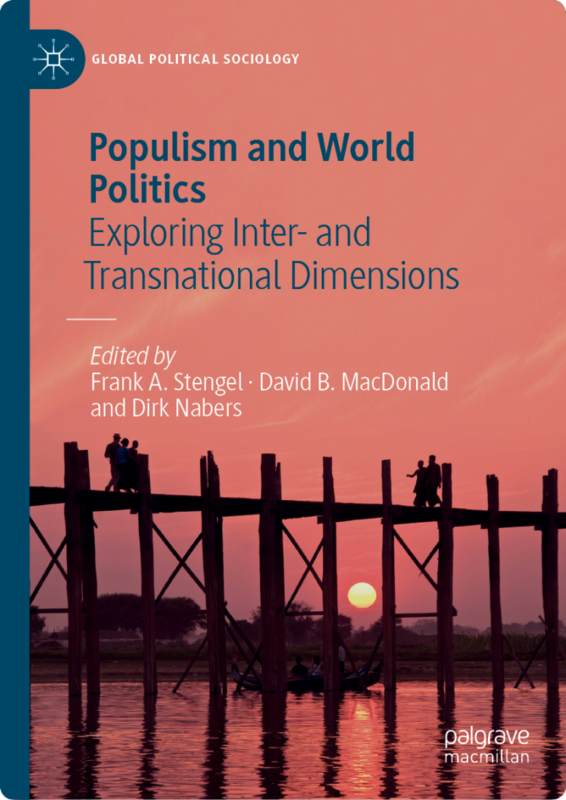 ), Populism and World Politics: Exploring Inter- and Transnational Dimensions, Basingstoke: Palgrave Macmillan 2019, with David B. MacDonald and Dirk Nabers. doi: 10.1007/978-3-030-04621-7 (pre-print). * “Non-state Actors and Foreign Policy”, in: Cameron Thies (ed. 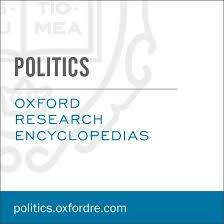 ), The Oxford Encyclopedia of Foreign Policy Analysis, Oxford: Oxford University Press 2018, pp. 266-286, with Rainer Baumann, doi: 10.1093/acrefore/9780190228637.013.456 (post-print, also available on ResearchGate and Academia). “Poststrukturalistische Diskurstheorie und Außenpolitk. Wie lässt sich Deutschlands wankelmütige Außenpolitik zwischen Afghanistan und Irak verstehen?”, in: Eva Herschinger/Judith Renner (eds. ), Diskursforschung in den internationalen Beziehungen, Baden-Baden: Nomos 2014, pp. 39-74, doi: 10.5771/9783845255873_37, with Martin Nonhoff (download). “Libanon (Südlibanon)” [Lebanon (South Lebanon)], in: Wolfgang Schreiber (ed. ), Das Kriegsgeschehen 2003: Daten und Tendenzen der Kriege und bewaffneten Konflikte, edited by Wolfgang Schreiber, 197-201. Wiesbaden: Verlag für Sozialwissenschaften 2004. “Libanon (Südlibanon)” [Lebanon (South Lebanon)], in: Wolfgang Schreiber (ed. ), Das Kriegsgeschehen 2002: Daten und Tendenzen der Kriege und bewaffneten Konflikte, 220-224. Opladen: Leske + Budrich 2003. Trump und der Populismus [Trump and Populism]. Berlin: Heinrich Böll Stiftung 2017, with Dirk Nabers (download). Vier Jahre Aktionsplan “Zivile Krisenprävention” – war das alles? [Four Years of the Action Plan for Civilian Conflict Prevention – Is That All?] GIGA Focus Global 11/2008. Hamburg: GIGA German Institute of Global and Area Studies 2008, with Christoph Weller. Review of Hans J. Gießmann/Armin Wagner (Hrsg. ): Armee im Einsatz. Grundlagen, Strategien und Ergebnisse einer Beteiligung der Bundeswehr, Politische Vierteljahresschrift 51:2 (2010), pp. 359-361.
Review of Daniel Nexon/Iver B. Neumann (Hrsg. ): Harry Potter and International Relations, Internationale Politik und Gesellschaft 1/2008, pp. 158-161.
Review of Tim Dunne/Milja Kurki/Steve Smith (Hrsg. ): International Relations Theories: Discipline and Diversity, Politische Vierteljahresschrift 48:4 (2007), pp. 795-797.
Review of Glenn Palmer/T. 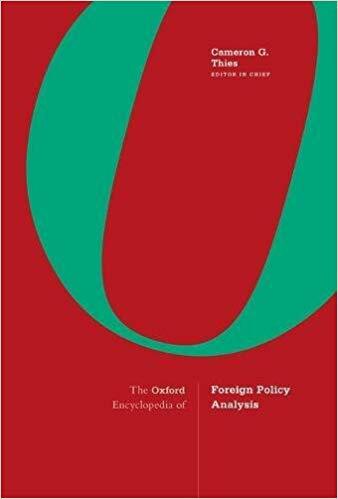 Clifton Morgan: A Theory of Foreign Policy, Zeitschrift für Politik 54:3 (2007), 362-364.
Review of Valerie M. Hudson: Foreign Policy Analysis: Classic and Contemporary Theory, Politische Vierteljahresschrift 48:3 (2007), pp. 619-621.
Review of David A. Welch: Painful Choices: A Theory of Foreign Policy Change, Politische Vierteljahresschrift 48:2 (2007), pp. 400-401.